If you are like me, you probably pay quite a bit of attention to brands around you – inside stores, on billboards, bus ads and so on. I tend to notice if something is new or unusual and start asking questions in my head. This happens especially when I see a co-branding initiative by two companies. I start thinking about the reasons why those particular companies decided that it was a good idea and whether it will be a success or a complete failure. I think that there are a lot of reasons why brands join forces in a partnership. Maybe the two products are complimentary to each other (like Betty Crocker and Hershey) or perhaps the companies want to increase awareness and break into new markets. Or maybe it is driven purely by the idea of increasing profits. In my opinion though, the most important reason is shared values between brands. These are also the most successful co-branding initiatives, as they naturally mesh well because of what they represent and what they mean to their customers. I am sure you can already think of so many great examples of co-branding partnership throughout the years and it is hard to condense it down to one short post. Nevertheless, I chose the below examples to include here, as I think they cover a nice range of different industries. I think this is such a classic example of partnership made in heaven. GoPro and Red Bull are made for each other, not only because they represent the same values for their customers but also because they both associated themselves with outdoor lifestyle and action sports. Over the years, both GoPro and Red Bull established themselves as lifestyle brands promoting extreme sports and an adrenaline-filled, action-packed lifestyle. If you think about it, Red Bull is not really in the business of selling energy drinks and nor is GoPro in the business of selling cameras. They are both in the business of promoting a certain lifestyle that resonates perfectly well with their target audience. I am sure everyone remembers the below video where Felix Baumgartner jumped from a space pod with a GoPro attached to him. The partnership between the two companies truly struck gold with this event. 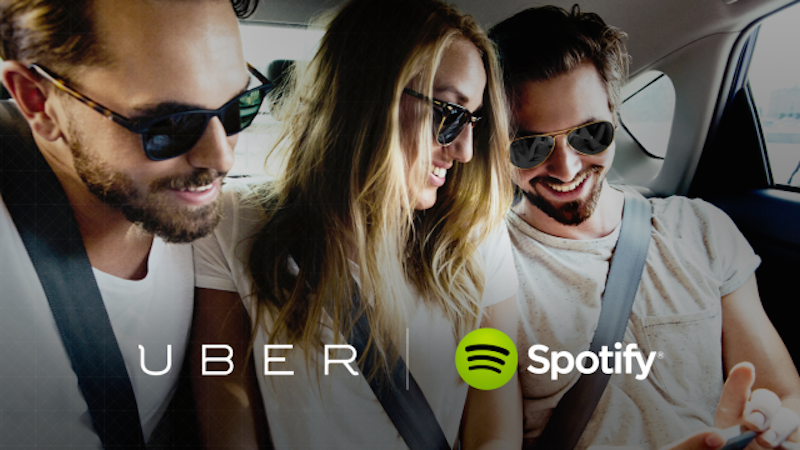 Another natural partnership that was meant to happen is the Uber & Spotify initiative. I like this example, especially because the two products could not be more different in their nature, yet they are extremely relevant in the way that people use them. For those who don’t know what the partnership is all about, Uber prompts riders to create or choose a playlist from their Spotify account that they would like to listen to for their trips. It is a simple but very powerful feature that adds to Uber’s value proposition. Also think about the two companies as major disruptors of established, old school industries like music sales and urban transportation. In my mind, this ties perfectly with the shared values argument, as both brands have this fundamental resemblance that they are innovators and disruptors in the way that they do business. The partnership means one more additional benefit for Uber to distinguish itself from taxis and for Spotify to give its subscribers one more avenue to use its product, it’s simple and brilliant. But this is exactly why the initiative made sense. Targeting the male population lets the producers speak to only 50% of the population. And there are a lot of female Star Wars fans out there that may have been feeling neglected all these years. 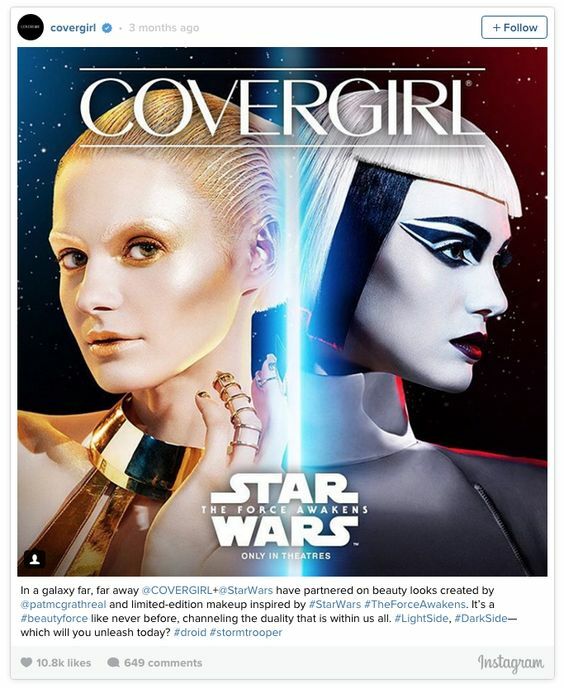 The partnership between Cover Girl and Lucas film allowed both brands to address a much broader audience. The product was a makeup set that was created by Pat McGrath and it featured “light side” and “dark side” styles, referring to the movie. And once again, the two products could not have been more different from one another but it made perfect sense in the context and turned out to be a win for both Lucasfilm and Cover Girl. At the end of the day, it is about seeing an angle that will resonate with the audience. There are so many other examples of successful partnerships that this is in no way an exhaustive or comprehensive list.